A couple of months ago, the wife and I moved into a larger house. The advantage of this is that I am closer to work and we have more space. The house is nice, and it has hardwood floors. The advantage of hardwood floors is that they are easy to clean. The downside is that the house is frequently cold in winter (i.e., October through May). I’ve noticed that it is cool in the evenings, and so has the cat. She likes to stay upstairs during the day where it is carpeted, and the heat also rises. The wife turns down the heat during the day so it is cool indoors and I turn it up when I get home so I don’t freeze to death. The house has central heating with vents where warm air percolates through. The air feels nice, and the cat has noticed. One of her favorite activities is sitting near the heater vent and staring into it, letting the warm air blow into her face. 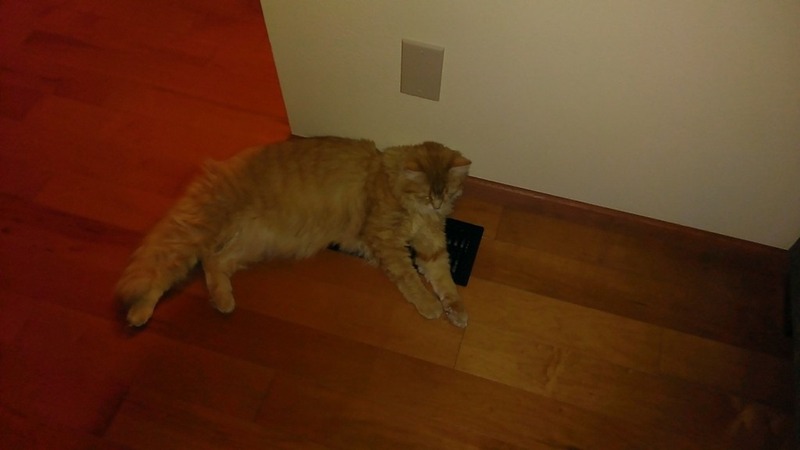 She also likes to lie on the vent and let the air warm up her tummy. I picked her up one time and she definitely was warm. No wonder she likes it so much.